At the last minute we decided that we wanted to go away for the weekend, so in the morning we decided to search on the internet for somewhere close by, where we could go self catering. I had in my head that I wanted to stay in a camper van or caravan where we would be away from the world. 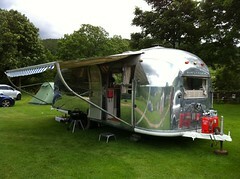 After a while searching we found a campsite who hired out a 1966 Vintage Airstream Caravan so we jumped at the chance. It was a little bit more than we wanted to spend at £360 for 3 nights, but it was exactly what we wanted. They are situated in little village called Appletreewick which is about 20 minutes from the centre of Skipton in the heart of the Yorkshire Dales. The campsite had very good facilities with a newly refurbished shower block and a little shop, which sold the essentials, but we didn’t need much else, and just kept ourselves to ourselves. 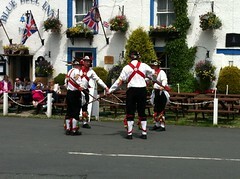 On the Saturday, we went to nearby Grassington, which is full of lovely little gift shops and tea rooms, then on to Kettlewell where we were treated to a little Morris Dancing. 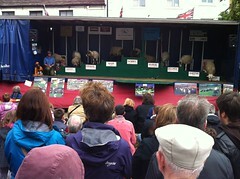 On the Sunday, we went into Skipton who were hosting their annual ‘Sheep Show’ in the town centre. There was lots of local food stalls, sheep races and the very funny ‘The Sheep Show’, which was an educational show about sheep & wool & ended up in the different types of sheep each doing their own little dance. Yes, I’m telling you, there was a Moon Walking sheep!!! 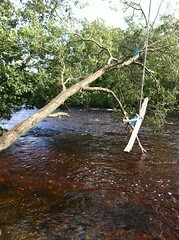 The weekend was topped of with a lovely walk down by the River Wharfe, which is literally at the bottom of the campsite, followed by a lovely sunday roast cooked in our own little caravan. I really didn’t want to come home.